Matthew Kennedy O’Brien was born in Rainhill to Thomas and Ellen in 1891.The family consisted of six boys and two girls. At various times, they lived in Sutton at 36, Walkers Lane and 10, Milton Street and Market Street, Rainhill. His father, Thomas came from Ahana, Ireland and worked at the Blue Works in Micklehead Green. In 1911, Kennedy was a miner working below ground. Kennedy attested to the army in Liverpool on 14th August 1914 after receiving notice and joined the King’s Liverpool Regiment 10th Battalion as Private 3425. He was found to be physically fit on 29th August and after training embarked for France in November with the British Expeditionary Force. He returned to France in March 1915 where he remained until his death on 9th August 1916. Altogether he served for 346 days. During his time in France, Kennedy was admitted to a Rehab. Station with eczema and treated at 147 and 8 “Ambulance Stations” for influenza. He was also admitted to hospital in Rouen and transferred towards England on the H.S Asturies with “frost-bite” feet. This ship was later torpedoed off Start Point by German U-boat U-66. Kennedy was appointed Lance Corporal on 12th October 1915 and promoted to Corporal in March the same year. Medal entitlement: - 1914 Star, British War Medal and Victory Medal. His father received his personal effects: - an identity disc, a wallet and a photo in December 1916, his memorial scroll and plaque in 1920 and his medals in 1922. Kennedy is remembered on Thiepval Memorial, pier and face 1D, 8B and 8C. The H.S. 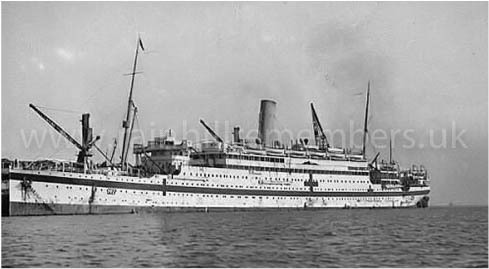 Asturies hospital ship on which Kennedy sailed back from France with "frost-bite" feet.